This dessert is so simple to make and it takes so little of your time with little ingredients to fix. However, it takes more time about 3-4 hours to set. I came across few other recipes besides Ellena’s, just to name the two, Sonia’s and Ann’s. 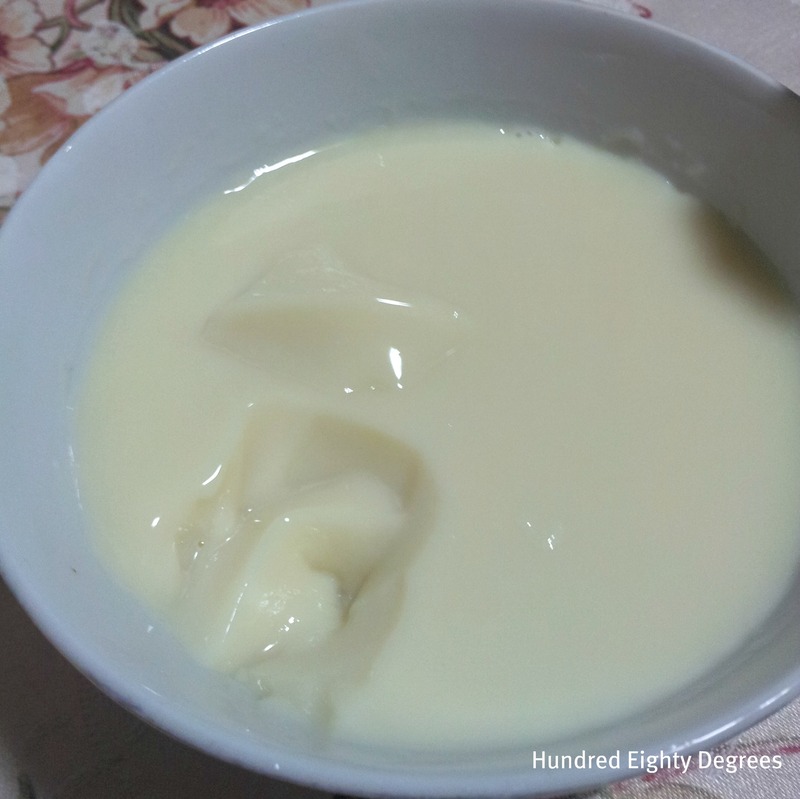 Sonia used fresh soy milk & agar-agar powder while Ann used soybean powder, sugar, creamer, instant jelly and water. Do hop over to see their lovely dou hua. I used Ellena’s recipe as I have the ingredients. Don’t forget to click on Ellena’s blog too. On my first attempt which you can see that my dou hua was not soft and tender because I misread 2 teaspoons gelatine as 2 tablespoons. 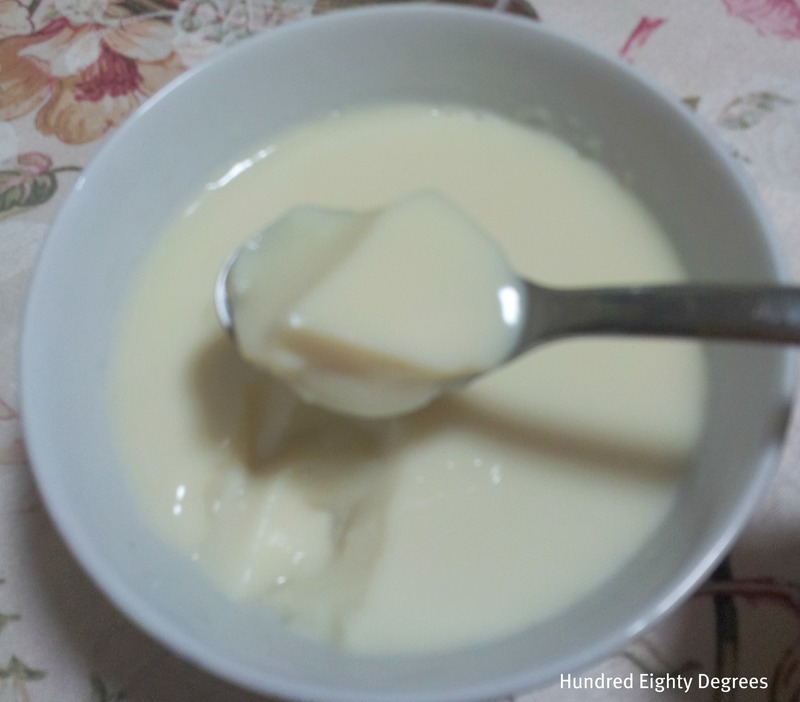 Despite the blunder, the pudding with more gelatine has a kueh-like texture which did not taste that bad though. I am not suggesting to use 2 tbsp because here we are talking about soft dou hua. DH commented that the ‘kueh’ was not sweet enough, could it be because of less premium brand of soya milk I have used or perhaps the extra gelatine has reduced the sweetness? Beats me. I reattempted the same recipe, this time with the correct amount of gelatine and a thicker soya milk from Mr Bean. Can you tell the difference now? This is what I call a good dou hua, silky soft and tender. Isn’t it? By the way, sweetness is just right for me this time, and DH didn’t utter a word about the sweetness level. 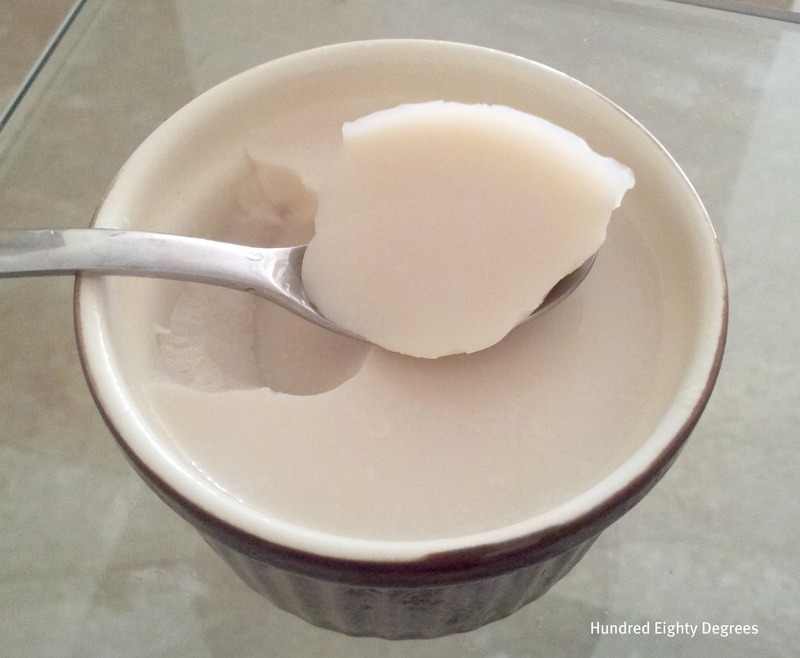 This dou hua is consumed chilled without extra sugar syrup. 1. 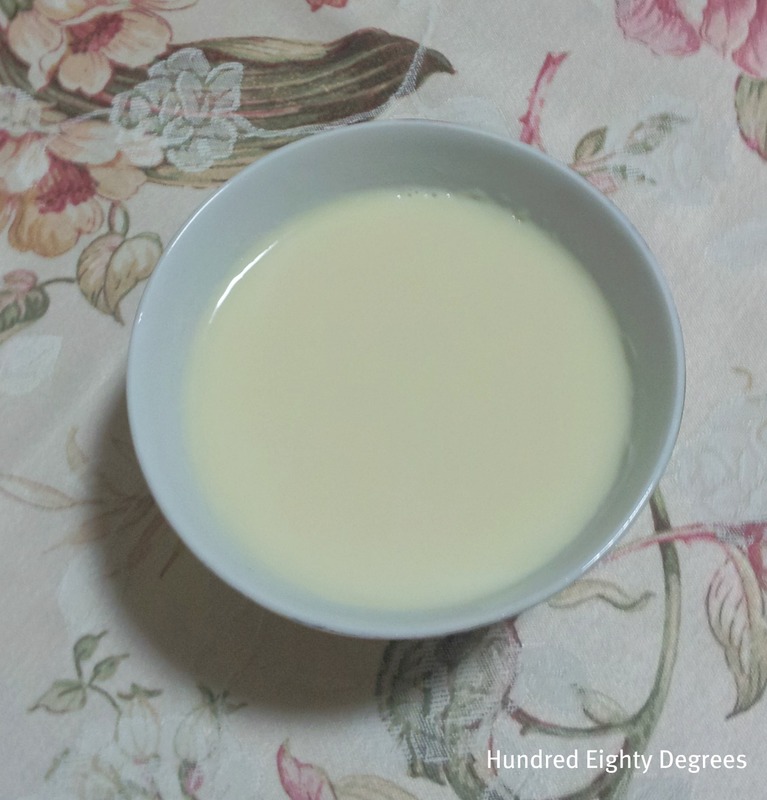 Heat up soy bean milk in a saucepan over low heat ( do not let it boil ). 2. Put gelatine powder in a small bowl, ladle about 50ml of the warm soy milk in it and stir till gelatine powder melt and well mixed. 3. Next pour the gelatine mixture into the remaining warm soy milk, stir in creamer if using and let it simmer for another 30 seconds ( careful not to let it boil ). 5. Chill mixture for at least 3 – 4 hours in the fridge before serving. Mangoes are now in season! I have 3 reasonably large mangoes for just 1 buck (S$). 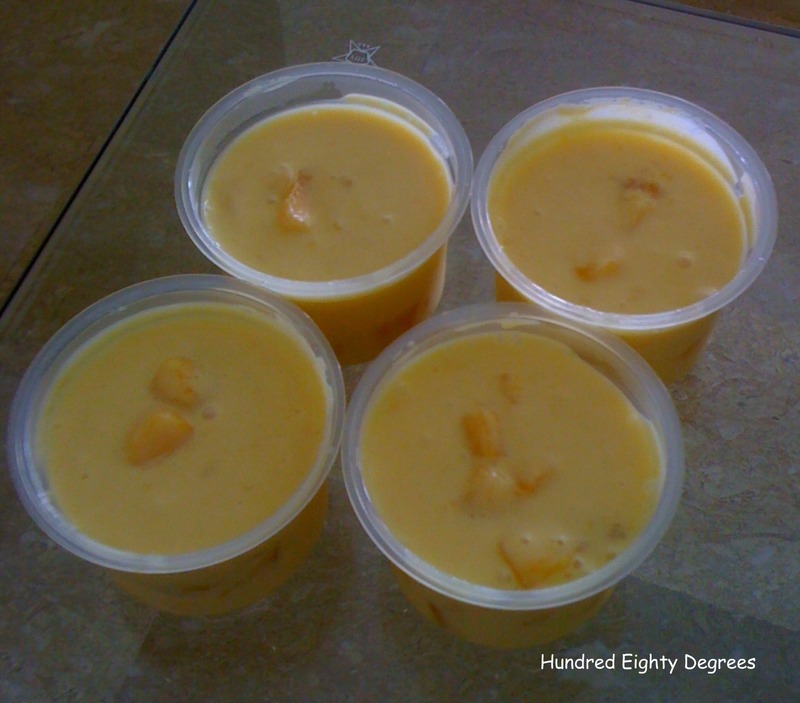 Good time to make mango pudding. I tried recipe from Baking Mum before and this time round I attempted this recipe from Food 4 Tots. Both recipes are equally fantastic, one incoporates ice-cream while the other does not. 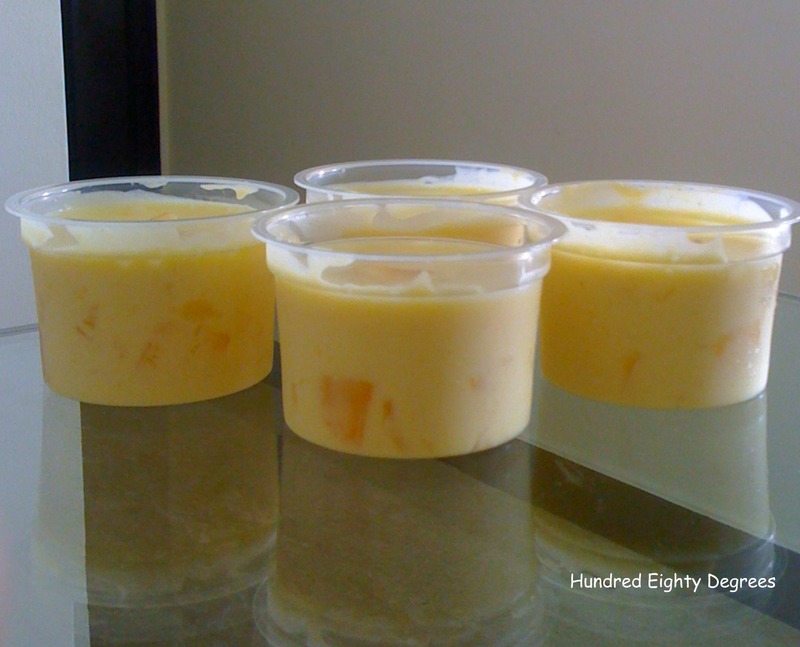 This rich, smooth and creamy pudding completes with plenty of mango cubes is heavenly. Sweetness is just right for my liking. I’ve also included Baking Mum’s recipe in this post. 1. In a small bowl, sprinkle gelatin powder over 60ml water. 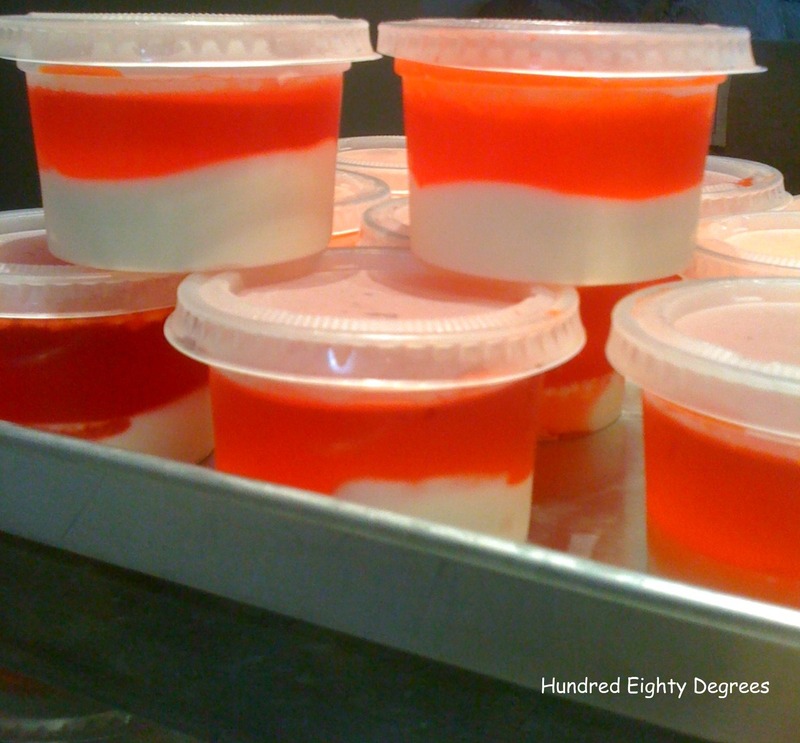 Let the gelatin absorb the liquid and bloom (meaning each granule becomes enlarge). Set aside. 2. Cut mangoes into cubes, add in 1tsp lemon juice and mix well. 3. Blend 375g mango flesh into puree. Add in 1tsp lemon juice and mix well. 4. Use a medium saucepan, add in 150ml water and sugar. With low heat, bring it to boil to dissolve sugar. Turn off the heat, remove from heat, add in soaked gelatine into the pan to combine with the sugar mixture. 5. Add in mango puree and mango cubes, mix well. 6. Add in fresh cream or whipping cream, mix well. 7. 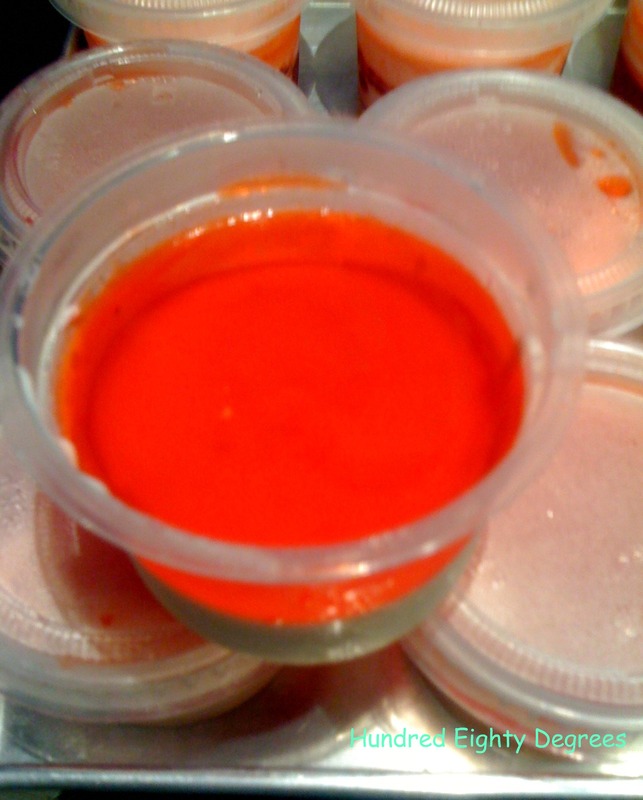 Place the saucepan of pudding mixture over a larger container/pot that filled with ice-water. Use a spatula or wooden spoon to stir the pudding mixture until it becomes slightly thick. 8. With a ladle, scoop the mixture into moulds. Cover the mould with cling wrap or lid and chill in the fridge for at least 2 hours or overnight for the puddings to completely set. 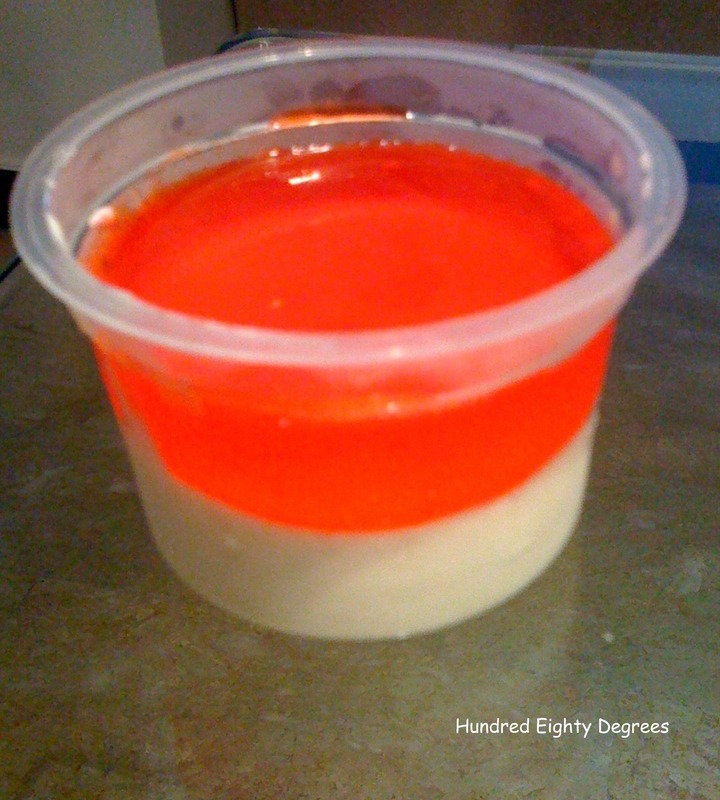 It is the contrast of the rich vanilla flavour mousse and the sour raspberry jello that makes this dessrt delicious. 1. Base (vanilla mousse) : Place milk and sugar in a saucepan. Sprinkle gelatine into milk mixture and stand for 5 minutes. Place saucepan over low heat and stir until gelatine and sugar have dissolved. Add in vanilla essence ( Mix well ). Leave it to cool. 2.Place whipping cream in a mixing bowl and whisk until stiff, strain in cooled milk mixture of no.1. Mix until well combined. Pour mixture into glasses and chill until set.